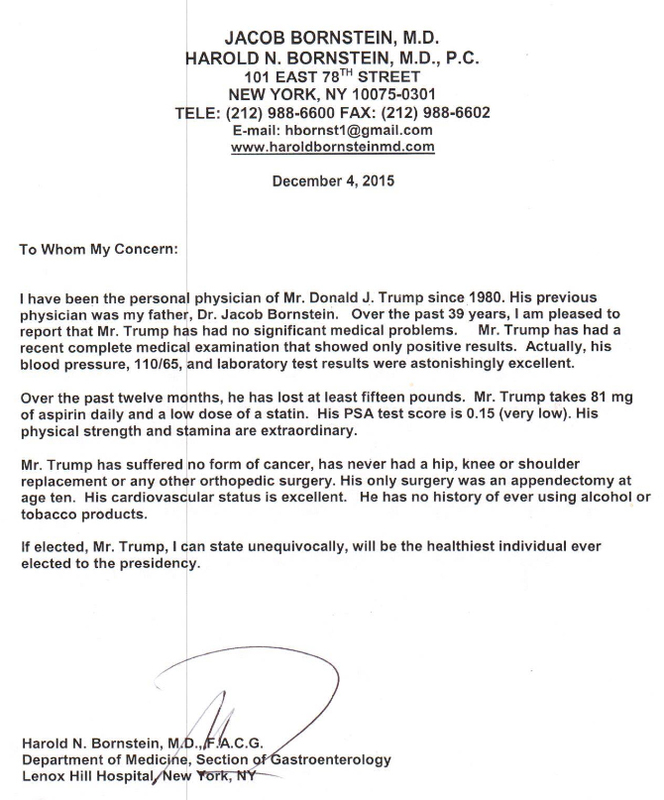 I am proud to share this report, written by the highly respected Dr. Harold Bornstein of Lenox Hill Hospital, stating that I am in excellent health. Here’s Dr. Bornstein’s site. It’s been down since this morning. That’s it. That’s the full medical report. How many phrases of hyperbole are there? If he is so healthy, “cardiovascular status is excellent,” why is he taking a statin? Back on the 3rd, I wondered how a diet of bacon, eggs, steak, and hamburgers, and a lifestyle of no routine exercise and little sleep (all of this is claimed by Trump himself) can result in perfection. I guess it can. I think Dr. Bornstein did what Mr. Trump asked him to. He issued a report that showed perfection. Doesn’t matter that it’s not in any way comprehensive or credible. This entry was posted in Uncategorized on December 15, 2015 by Bix. Well now, think I’ll go back to my original answers to your questions as to his producing records and is/is not taking prescription drugs. A bit of a reprieve, but who knows really? It seems nothing is what it seems on the political scene.